This week my husband and I headed to Tarkwa in the Western Region of Ghana. Driving along the palm-lined coast we passed through Elmina and Cape Coast (whose grim slave castles earn this region a place as a UN World Heritage site). Instead of Accra's Ga kenkey, we passed roadside stands selling the Fanti version. We stopped for a lovely lunch: cassava and plantain fufu with goat groundnut (peanut) soup and I chatted with Theresa Anokye, the demi-chef responsible for the soup. I was delighted to find that this restaurant regularly features a weekend buffet of traditional Ghanaian foods that moves beyond the ordinary dishes to include those less familiar (to tourists), like tatale and bambara beans or aprapransa. Ah, yes, note the Star beer, too. And my Africa Cup of Nations scarf. Things have already been hectic in 2008: 3 continents in as many weeks. We left Brazil Jan. 2, 2008, were in Pennsylvania for 5 days, and arrived in Ghana on Jan. 10. I still have many things to share from Brazil (such as how to make goma and how to prepare cassava/manioc filled pancakes), but right now I'm working on solving technical problems so I can upload photos and videos using my internet connection in Ghana. Today is my first try. 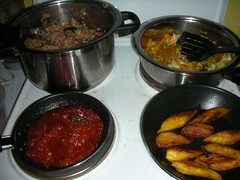 Last night I cooked up some waakye (pronounced "WAAchi where the "i" sounds like the "i" in "in" and made from rice and beans or black-eyed peas), fried some ripe plantain slices, made a little gravy (oil, onion, tomatoes, hot peppers, salt and tomato paste), and stir-fried some cabbage and carrots for dinner. Here's a picture to mark our new location and the foods easily accessible here. Question #7: Isn't the food really unhealthy?